energy saving, low noise, simple structure, the main electrical components imported, high-speed, high efficiency. which provides the high quality wire. (11) Tuning roller:①Using Pneumatic anti-tension tuning , the tension is adjustable; guide pulley are sprayed with WC, useful life is more than two years. Sensor adopt angular displacement non-contact way, schneider sensor imported from Germany, make the process of template matching wider, mould can be automatically compensated after wear and tear, and it is difficult to break line. arm, between the two drum with sensors the match between two drum speed adjustment. ① First, second block adopted Machine of decelerate of hard tooth surface gear transmission, 20CrMnTi gear material, surface hardness HRC62 °, surface finish Ra0.8, reducer adopts the reflux circulation lubrication of bearing, and design the lack of warning and automatic stop function. 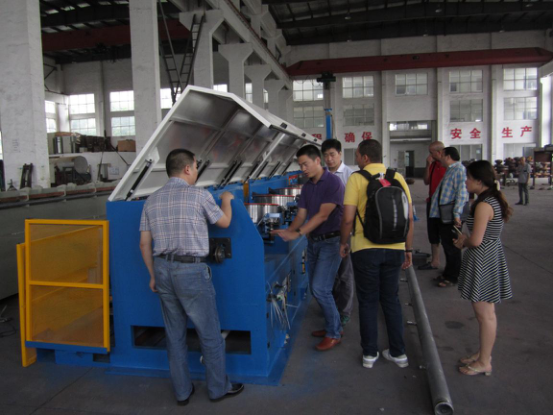 Configuration reducer can make customer drawing a little higher tensile strength of low carbon steel wire, the rest for two-stage transmission adopts powerful v-shaped moving belt. 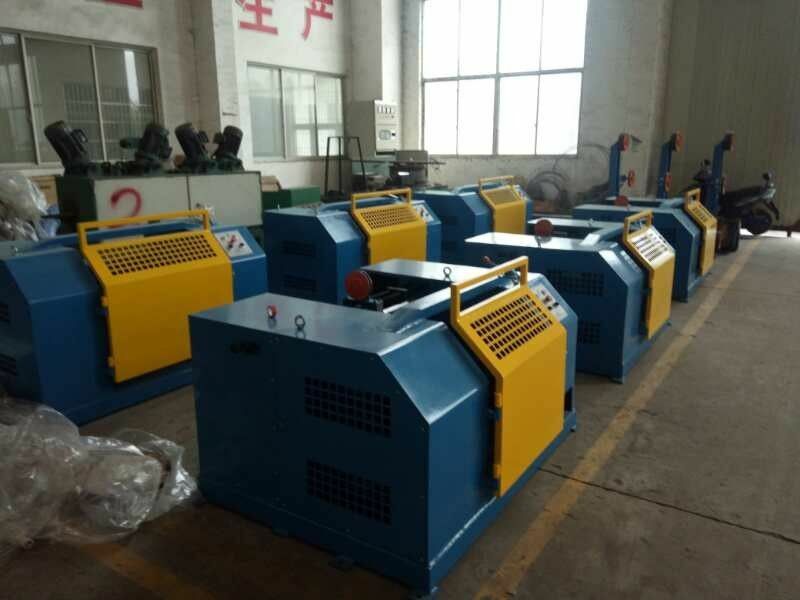 ② Each block with electromagnetic valve control efficient pneumatic brakes, brake force can be adjusted, ensure that emergency parking constantly silk wire drawing machine. (16) Wire drawing machine bearing: adopt NSK bearings made in Japan. manufacturer production cabinet put oneself in another's position. ② working way::straight line wire drawing machine control system adopt ac frequency conversion control, PLC logic control, full digital control, adopt imported high grade components, strong anti-interference ability, fast operation, is not only stable and reliable in operation, low energy consumption, and greatly improves the production efficiency, but also has multiple protection function, when shield equipment high speed open or have other fault occurs, the automatic stop device. After each machine is equipped with the points, the former linkage, linkage, the function such as start, stop, stop, work station of the main display, man-machine interface with the length of the preset speed preset display, fault query, equipment status, computer mold fitting, etc. the system generally using PLC programe control, frequency converter, touch screen to finish data exchange through communication, PLC can control reading, writing, turning on, turning off of frequency converter freely. PLC software can ensure programming and setting up automatic to the different drawing process, and it also can ensure operate smoothly; color screen man-machine interface can monitor the running conditions of equipment and fault display at anytime. Each process parameter can be set by the touch screen input. high precision, better accuracy, easy amendment, and can assure drawing process wider, realize jumping mould drawing easily. 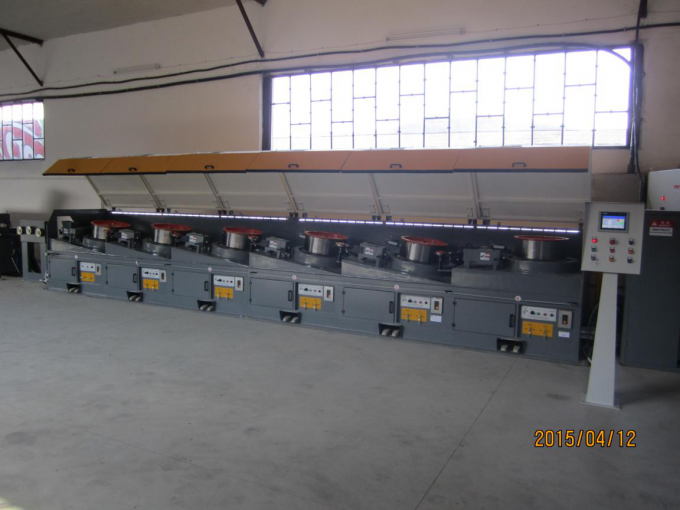 The whole system runs smoothly, low fault ratio, easy operation. 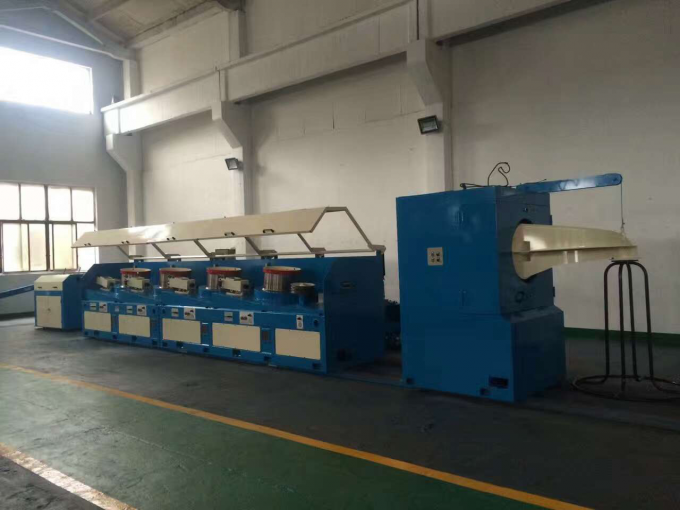 ① The basic function in wire drawing machine is complete; Single machine is punctual, leftist writers point move, single point, leftist writers (right) running, stop; Tuning roller tension adjustment, mould box and roll cooling water regulation. 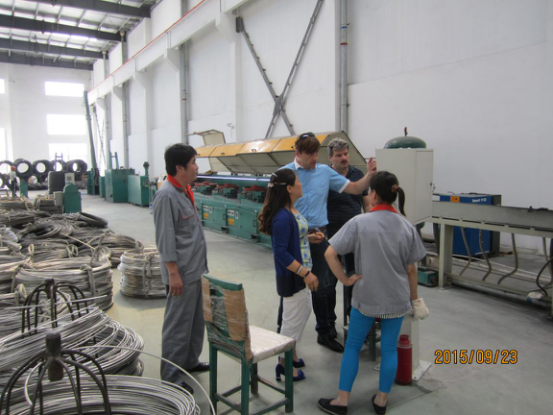 China Good Quality Straight Line Wire Drawing Machine Supplier. Copyright © 2017 - 2019 straightwiredrawingmachine.com. All Rights Reserved.